Everything You Need to Change Fixtures in Less Than One Minute The Jergens Ball Lock Quick ChangeKits speed fixture changeover in all types of manufacturing operations. Each kit includes two aluminum fixture plates with liner bushings installed; one steel subplate with receiver bushings installed; and four 20mm Ball Lock shanks with working loads of 3000 Ibs. Each. While one fixture plate is on the machine, the operator can load parts on the other. This minimizes downtime for true set-up reduction. 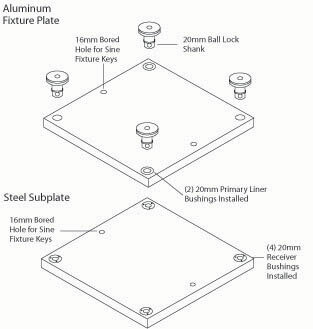 To enable the subplate to be mounted on a slotted table without the need to indicate the subplate, sine fixture keys can be used. The sine fixture key reamed holes are oriented parallel to the receiver bushings on the subplate and to the liner bushings on the fixture plate. These also allow the fixture plate to be mounted on a toolroom mill without the need to indicate it. This is extremely useful when machining location points on your fixture. Jergens also offers custom made plates or kits to your specifications - Contact Customer Service for more information at 1-800-Jergens (537-4367).